League of Melbotis: Who was Watching the Watchmen's Licensing Dept? Who was Watching the Watchmen's Licensing Dept? I wrote about all this coming not but a week ago. 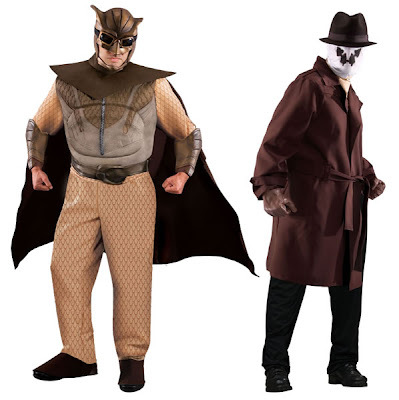 The comics blogosphere is abuzz about these Halloween costumes from Watchmen. Here. I think Horus and JMD need to team up and goes as Ozymandias and Dr. Manhattan this year. Alan Moore must be laughing himself to death. I just hope Gibbons winds up with a gold house and a rocket car out of all this. 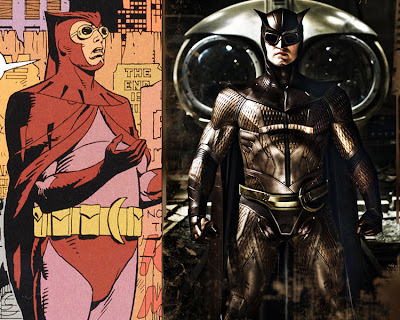 Well, the guy in the Nite Owl suit actually looks a bit more like the one in the comic than the fellow in the rubber thing in the movie. The manufacturer has no idea what this movie is about, do they? 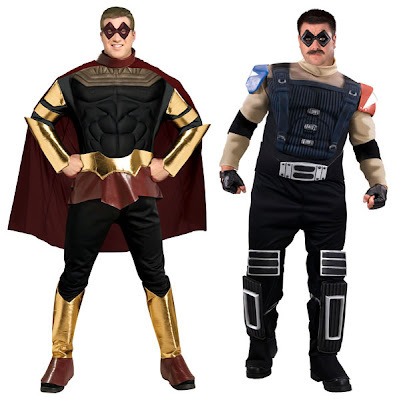 And for those of you wanting to go as either Super Dork or Drunk Nascar SuperFan, are you in luck! I can't wait for your kids to start demanding their very own Comedian action figures. Sadly, I can't speak to why its kind of messed up without giving away major parts of the plot, but... yeah. You might want to see the movie before getting your kids jazzed about Comedian bedsheets and an Ozymandias role-play set. Look, Watchmen was one of two comics that sort of made comics unsafe for young children. The general populace got a glimpse of that this last summer with Dark Knight, and just as Batman and Watchmen were responsible for a sea change in how we think of superheroes in 1986 for comic fans, they're poised to do it again for the general audience. I sort of expect there are going to be the same outraged parents groups insisting that superheroes are for kids, so how could you do this? And that's okay, but... you know, they still have plenty of superhero stuff that's safe for your kids. You just might need to be a bit more vigilant about what they read and watch. One the plus side, as you pointed out, I and most of the male population are pudgy enough to pull off a very realistic Owl costume. I see your point about marketing this stuff to the kiddies, but I gotta say that this has been a strange issue since long before Watchmen. Ever since Tim Burton's first Batman there's been something strange about kids wearing Joker tee shirts, and the most recent Batman movie drove the point home even more strongly with Ledger's even more psychotic Joker and the death of Ledger himself. Anyway, yeah, we don't need kids attending Halloween parties dressed as The Comedian. Creepy. It's my belief that the licensing departments just don't know any better, but that Watchmen may be the tipping point. I agree that it was a poor decision to license the current Batman film for toys to the general market. But as a small kid, I recall wearing a shirt with Darth Vader on it, and that dude walked around mime-strangling anyone who got in his way and light-sabering old British actors. So... I dunno. I think the slippery slope of Watchmen is that at least the Joker is identified as a villain, but as those who've read the story, things are not clear cut. Watchmen has always only existed as the self-contained series. There hasn't ever been a "Lil' Watchmen" or Watchmen aimed at the children's market. But as comic characters, it seems like things are just on auto-pilot. What works for the Spider-Man movie works for Ozymandias. I think The Simpsons hit this nail right on the head during the episode where Alan Moore appeared. In it Millhouse asks Mr. Moore who is his favourite Watchmen babies character. FYI, I finally saw The Dark Knight this past weekend. And there were some parents there with kids under 10. At one point, one of the boys asked of the Joker: "Why did he say there are going to be auditions?"